The Brainstem lies at the base of the brain and the top of the spinal cord. It houses many of the control centres for vital body functions, such as swallowing, breathing, and vasomotor control. The brainstem is generally said to be composed of three parts. This consists of 3 parts: the tectum, the tegmentum and paired cerebral peduncles. The substantia nigra lies in the cerebral peduncles. Consists of a posterior part, the tegmentum, and an anterior basilar part. The "bulb" is an archaic term for the medulla oblongata, and in modern clinical usage the word bulbar (e.g. bulbar palsy) is retained for terms that relate to the medulla oblongata. The word bulbar can refer to the nerves and tracts connected to the medulla, and also by association to the muscles thus innervated, such as those of the tongue, pharynx and larynx. The brainstem is located in posterior cranial fossa. Above, the midbrain is continuous with the cerebral hemisphere. 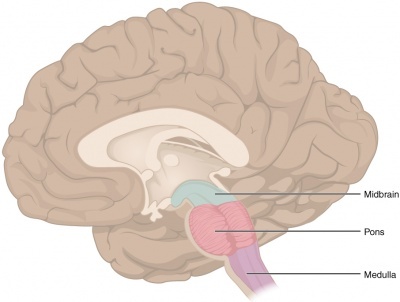 Below, the medulla is continuous with the spinal cord. Posteriorly, the pons and medulla are separated from the cerebellum by the fourth ventricle. 3. 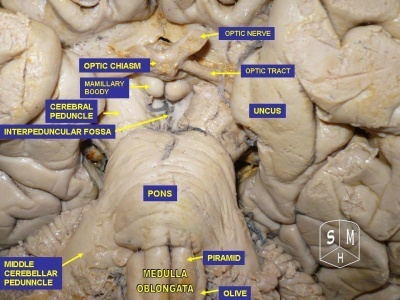 Contains the nuclei of Cranial Nerves III to XII. Other autonomic functions such as digestion, salivation, perspiration, dilation or contraction of the pupils, urination, etc. Brainstem lesions frequently occur in Multiple Sclerosis, with visual problems including blurred double vision being a common early symptom of MS.
Central pontine myelinolysis is a concentrated, frequently symmetric, noninflammatory demyelination within the pons.